At Intercom, thinking about the way we work is almost as important as the actual work we do. That’s just part of the company culture, and we have an amazing team of content editors supporting, helping and guiding employees to put their thinking on paper. With their help, I had the opportunity to publish an article that is very special to me. It’s called “Unflattening Design”, and before sharing the link, I’ll tell you more about the story behind it. After many years working as a designer, I've started forming a thinking on my discipline. For instance, I noticed that I was constantly picturing the process of ideas exploration with the same metaphor in my head: each idea was like a diamond shaped entity living in a sea of more diamond shaped entities. One part of my designer's job was to reveal the different facets of a diamond by manipulating the idea, by trying to reframe it and to tackle it trough different angles; and another part was about discovering more diamonds by understanding the problem behind an idea (the "why") and by exploring different options to answer this problem (the "how"). Over time, I wrote many drafts of articles but I've never been able fully capture the thinking. Until I came across the great "Unflattening" written by Nick Sousanis. This book has been a revelation in 2 ways. First, a large part of the book was discussing the exact topic that I was trying to express (ideas exploration). But on top of that, the main message of the book was about explaining why text is not always the best medium to express ideas, and how mixing it with other mediums like images can enable new perspectives and new means of expression. So I tried to take inspiration form the book, and to combine images and text to express my ideas. First draft of the article from my notebook! This article is actually a small part of the thinking. 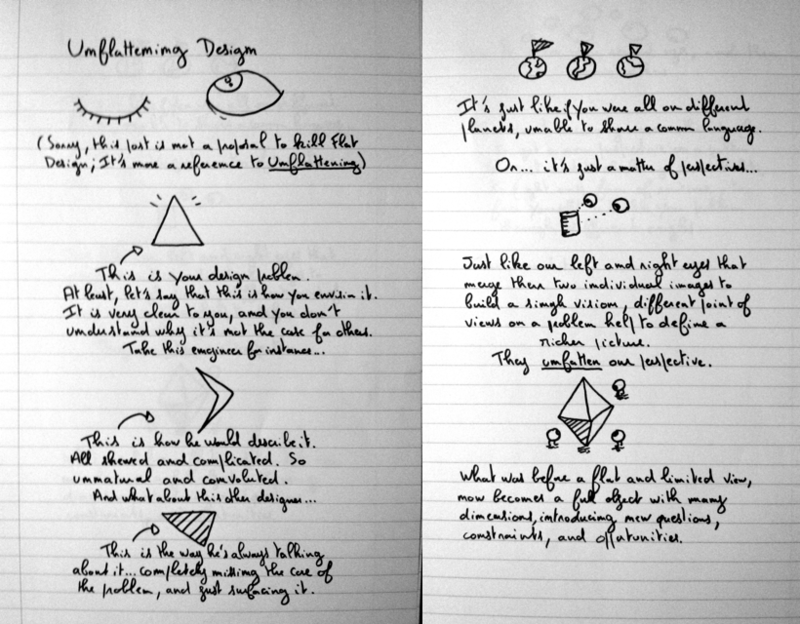 With "Unflattening Design", I was focusing on the way we explore ideas. I still have several drafts about other facets like the way we share ideas. I'd love to find some time to flesh them out and to publish them. In the meantime, "Unflattening Design" is a good summary of the way I think about design.